In the history of the heroic pulps (the science fiction and fantasy pulp magazines were a different matter), for the most part women fell into two categories. They were either damsels in distress to be rescued or femmes fatales out to corrupt or destroy the hero. There were two exceptions to this rule. One exception could be found in the pages of The Spider. 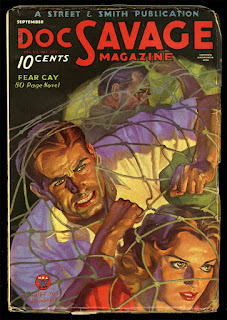 Nita Van Sloan differed from most women in heroic pulps not only in that she and the love of her life, Richard Wentworth (AKA The Spider), were openly affectionate, but in that she took an active part in his adventures. She could wield a gun as well as any man and even donned The Spider's robes when the need arose. The other exception appeared in the pages of Doc Savage. That exception was none other than Doc's own cousin, Patricia "Pat Savage." Patricia "Pat" Savage first appeared in the novel Brand of the Werewolf, published in Doc Savage January 1934. Given that the latest issue of Doc Savage generally hit the newsstands on the third Friday of the month, it would be safe to say that Doc Savage January 1934 went on sale on December 22 1933. Not only was Pat Savage the only woman to appear in more than three Doc Savage adventures, but she appears in 37 of them in total. That is nearly one fifth of all the adventures of the Man of Bronze. If Pat was popular with the readers of Doc Savage, there should be little wonder. Pat was unique in the heroic pulps. She was a beautiful woman possessed of an incredible figure and enough feminine wiles to talk most men into anything. At the same time, however, she was no wallflower when it came to adventures. She was an expert marksman, preferring her powerful, antique single action revolver to more modern weapons. She could scrap as well, if not better, than any man, skilled in boxing, fencing, and later jujitsu. Pat's talents extended well beyond fighting. She spoke more than one language (including Mayan). She knew Morse code. She could fly a plane. And, as she often claimed (most notably in I Died Yesterday), she had the family compulsion toward seeking adventure, which she shared with Doc (although the Man of Bronze would be loath to admit it). In many respects she was as much a superwoman as Doc was a superman. Pat's first appearance in Brand of the Werewolf is, as might be expected, a dramatic one. In the novel Doc and the Fabulous Five travel to British Columbia on vacation to meet his uncle, Alex Savage, and his cousin, Patricia Savage (the Fabulous Five are Doc's assistants: Monk Mayfair, a chemist; Ham Brooks, a lawyer; Renny Renwick, a construction engineer; Long Tom Roberts, an electrical engineer, and Johnny Littlejohn, an archaeologist and geologist). Unfortunately, they do not get to enjoy their vacation. While still aboard the train, attempts are made upon their lives. And when they arrive at Alex Savage's cabin in the Canadian woodlands, they find that he has been murdered. When Pat first appears, then, she is ready for combat. She is wearing a grey shirt, breeches, and boots. She wears both a cartridge belt and a holster containing her favoured weapon--the single action revolver handed down in her family from the days of the Old West. Even though Pat is dressed in very unfeminine fashion, her charms are still blatantly obvious. She has "a wealth of bronze hair" that resembles Doc's own mane. She also has an incredible face and figure--"Her features were as perfect as though a magazine cover artist had designed them." On seeing her Monk remarks that she could be Doc's sister. He is also convinced that she is the most beautiful woman he has ever seen. For once Ham agrees with Monk on the extreme beauty of Pat Savage. For the most part in the novels, Pat's appearance would remain largely consistent. Spook Hole again mentions that her hair is "...of a remarkable bronze hue." Pat's bronze hair is mentioned again in such novels as The Awful Dynasty and others. Patricia is undoubtedly proud of her bronze locks. When a man in The Black Spot describes her as "red-headed" she grows very angry. That having been said, it seems that she might have dyed it a few times. In He Could Stop the World her hair is described as golden blonde, while in Death is a Round Black Spot it is described as a bronzish blonde. While Pat's hair color may have varied from time to time, the colour of her eyes would not. While they are not described in Brand of the Werewolf, Fantastic Island initially describes Pat's eyes as blue, although it only a few pages later that it states that she has golden eyes like Doc. Throughout the novels they would remain golden. The novel Weird Valley states that she has "the family characteristic"--golden eyes. Throughout the novels Pat's face and figure also remains consistent. In Spook Hole she is described as "tall and exquisitely beautiful." The Laugh of Death reveals her exact height to be five foot, seven inches. This would have been tall for a woman at the time. Pat is often said to be Doc's cousin, although the exact relationship is not always consistent in the novels. In Brand of the Werewolf, Doc describes Pat's father, Alex, as an uncle he has never met. Later, in Violent Night Pat claims that she is Doc's third or fourth cousin. She also said that she was born in Canada. That she was born in Canada may be ascertained by the fact that she lives there in Brand of the Werewolf, as well as her reference to a grandfather who fought Indians in the Northwest of Canada in I Died Yesterday. As to Pat's exact familial relationship to Doc, given the fact that Doc describes her father as his uncle, it is certain that Doc and Pat are first cousins. Indeed, in Violent Night it seems most likely that Pat was bluffing when she claimed she and Doc were only distantly related. A woman remarks that she looks like Doc's sister. Regardless, in Brand of the Werewolf and other novels she is described as Doc's only living relative, while in The Time Terror it is states that she is "one of Doc's few living kin." Although Doc and Pat are first cousins, their relationship can be described as that of a big brother to a little sister. Like most little sisters, Pat wants to tag along for all the fun her big brother is going to have. And like most big brothers, Doc doesn't want little sister tagging along. It is clear that to some degree Doc trusts Pat. In The Spook Hole it appears that she has a key to Doc's 86th floor headquarters, although by the time of The Fiery Menace it appears it has been taken away (she has to pick Monk's pocket and steal his key simply to get into the 86th floor). She has access to Doc's unlisted, private number, which she uses on occasion (perhaps most notably in I Died Yesterday, the one adventure narrated by her). To a degree the Man of Bronze has even come to expect his cousin to be a part of his adventures. In Murder Mirage it is revealed that he keeps spare clothes for her on his dirigible. In Murder Mirage Patricia Savage is even charged with delivering Doc's gold from the country of Hidalgo to New York. Doc has also given her the frequencies with which he contacts his aides on short wave radio. In The Mental Monster Doc requires her expertise and tries contacting her through the short wave radio, to no avail. And while Doc often does his best to discourage Pat from taking part in their adventures, he sometimes has need to call her for help. Doc asks for her help in Death in Silver, The Annihilist, The Feathered Octopus, and several other novels. Of course, once her help is no longer needed, Doc would just as soon Pat go home. Indeed, from her first appearance in Brand of the Werewolf to her final appearance in I Died Yesterday, a bone of contention between Doc and Pat is her involvement in his adventures. Often Pat will go to great lengths to muscle her way onto a case. In The Yellow Cloud Pat sneaks into the Hildago Trading Company warehouse and locks the exit from the pneumatic tube that goes to the eighty sixth floor headquarters. As result, when Doc and his aides arrive they are effectively trapped. Pat will only unlock the exit if she's allowed to help in the search for the missing Renny. Not only does Pat want to be involved in Doc's adventures, but she very much wants to be a regular part of his group. The best example of this may be in He Could Stop the World, in which Pat makes it clear that she would give up her lucrative beauty salon if only Doc would make her a member of his team. Not only did Doc constantly refuse to make her a member of the group, but he also tried to keep her off cases or, if she was on a case, dismiss her from it as swiftly as possible. In Fear Cay, when Pat visits Doc and the Fabulous Five, the Man of Bronze plans to drop her off before starting on the case. He only lets Pat tag along at Monk's insistence. In Spook Hole, after she had finished impersonating Nancy Law's voice for Doc, he summarily dismisses her from the case, which results in Pat leaving in a huff. While Doc is constantly discouraging Pat from taking part in their adventures, it is clear that he has genuine affection for her. When Pat visits in Fear Cay, he is genuinely happy to see her. For her part, Pat warmly shakes Doc's hand (unlike most female relatives, she is not about to hug the Man of Bronze). And like a little sister and big brother, the two do tease each other. In both Death in Silver and The Annihilist, when Doc asks for her help, she teasingly asks, "...Who's trying to kill you now?" For Doc's part, he is constantly bringing up the exorbitant prices she charges at her beauty salon. In I Died Yesterday he tells her to return to "...that refined piracy you call a beauty salon." While the two do tease each other, the teasing is of the sort rooted in deep, familial affection. When Pat is captured in Fear Cay, Doc offers up a $25,000 reward (not a small fortune in those days) for information leading to her whereabouts. When Doc visits Pat's beauty salon for the first time, she insists on giving him the grand tour, as if she needed her cousin to be proud of her. For her part, Pat often brags of her cousin's career of fighting crime. And the admiration is to some degree mutual for the cousins. In Spook Hole Doc confesses that Pat is "handy to have around." If Doc doesn't want Pat involved in most of their adventures, let alone a standing member of his team, it could be because he does not want to lose her as he did his father and his Uncle Alex. While Doc and Pat seem to have a warm, familial relationship such as that of a brother and sister, her relationships with the Fabulous Five tend to vary. That they are all fond of her there can be no doubt. Indeed, in The Spotted Men it is revealed that it was the Fabulous Five who taught Pat how to fly. That having been said, while they are all of fond of her, their relationships with her differ a great deal. For his part, Renny seems to regard Pat as the troublesome kid sister. In some of the novels Renny is even sterner with Pat about being involved with their adventures than Doc ever was. In The Feathered Octopus not only does Renny tell her to go back to "the mud packs and rowing machines and electric vibrators (in reference to her beauty salon)," but knocks her out with an anaesthetic gas when she refuses to leave. in Devil on the Moon, when Pat falls for a stratagem of the villain, Renny tells her that maybe now she will understand why Doc doesn't want women around on his cases. While Renny does not want Pat accompanying on the cases, it is clear that the two are friends. In The Man Who Fell Up, it is Renny who notes that Pat could sleep through the end of the world. And as mentioned in previously, in The Yellow Cloud Pat insists on joining in the search for Renny. Renny sometimes treats Pat as a pest, as does the group's misogynist, Long Tom. When Pat shows up in Waves of Death, Long Tom signals this by gesturing in such a way as to indicate such catastrophes as the earth exploding. It is clear, however, that Long Tom did not regard Patricia Savage as a kid sister. It seems that the misogynist of the Fabulous Five was actually in love with her. In The Awful Dynasty Long Tom outright has a panic attack when he thinks something might have happened to the "lovely Pat." While Renny seems to treat Pat as the pesky little sister and Long Tom seems to be in love with her, Johnny falls somewhere in between. It is clear he likes Pat, but he is never so stern with her as Renny is (even though he does object to her coming along on their adventures). It can be fairly certain that Monk was in love with Pat. He seems to have fallen in love with most pretty women he met, and in Brand of the Werewolf he comments that Patricia Savage is the prettiest girl he has ever seen. According to The Man Who Fell Up, it was Monk who taught Pat how to speak Mayan. In Fear Cay it is Monk who persuades Doc to take her along with them. In Hex when Pat finds June Knight in Monk's arms, Monk actually becomes flustered and tries to explain the situation to her. This is unusual behavior for a incessant womanizer, unless it is considered that Monk's feelings for Pat might have been more than platonic. While Monk may well have been in love with her, he was not below pulling pranks on her. In The Yellow Cloud it is told how Monk had once handed over a package to Pat and told her to go to the mountains and to guard the package with her life. Pat stayed there for a week, after which she suspected something. She opened the package to find it only contained the picture of a goat! It is difficult to say if Pat loved Monk back, but she was clearly very close to him. In The Man Who Fell Up it is Pat who names Monk's new chemical, which seeks out movement and warmth, "Compound Monk." Her reasoning is that both the chemical and Monk like to chase "...hot numbers." In Terror Takes 7 Pat throws a snowball at a man in an ugly green suit, thinking it was Monk. While it seems likely that Monk is in love with Pat, it is not quite so clear in the case of Ham. Like Monk Ham was a resolute skirt chaser. Unlike Monk, however, he does not fall in love quite so easily. That having been said, it seems obvious in Brand of the Werewolf that Ham is taken with Patricia Savage. He even breaks his long standing policy of disagreeing with Monk by agreeing with him that Pat is a knockout. As time wore on it seems that Ham could have been taken with more than Pat's appearance. In The Men Who Smiled No More Ham refuses to swear in front of Pat even though he is extremely angry at Monk. Given that Pat has been in every sort of society from the Canadian wilderness to New York City's 400, it is doubtful any sort of language could have surprised or offended her, but it shows that Ham does not want to even risk the possibility of doing so. While it is possible that Ham simply respects Pat more than most women, it is also possible that he does harbour some strong feelings for her. At any rate, like Monk, Ham has no resistance to Pat whatsoever. She can always talk the two of them into letting her tag along on cases. It would be hardly surprising if all of the Fabulous Five were not in love with Patricia Savage on some level. Not only is she incredibly beautiful, but she is also a woman of many skills. In Brand of the Werewolf it is quickly established that she is an excellent marksman. It is also revealed that she is a skilled boxer and accomplished at fencing. In The Yellow Cloud it is revealed that Pat also knows jujitsu, most likely taught to her by the female jujitsu artists she employs at her boutique. In Fear Cay she proves that she has considerable talent as an actress. Movie star Maureen Darling comments that she would make a good movie star, as she is not only incredibly beautiful, but "...a hell of a good actress." It is this talent that Doc asks Pat to use occasionally in the course of their adventures. In Murder Mirage Doc has Pat pose as Lady Sathyra Fotheran, which she does successfully. In Devil in the Moon she works in disguise. In Spook Hole Pat successfully imitates Nancy Law's voice. In addition to her skills at combat and drama, Pat was also an aviator, as mentioned above. And like her cousin, Pat does seem to have some facility with languages and codes. In The Fantastic Island (published in 1935) Doc actually speaks to Pat in Mayan, although it is later in The Man Who Fell Up (published in 1942) that it is revealed that Pat only recently learned Mayan. When Doc asks how she learned it, she tells him that she "...talked Monk into teaching it to me." Regardless of when Pat learned Mayan, she appears to have some skill in it. In Hell Below she uses a flashlight to signal in Morse code, not in English, but in Mayan! In The Yellow Cloud it is revealed that Pat has learned sign language, while The Invisible Box Murders reveals that she can read lips. Of course, there are perhaps some skills Doc would probably rather Pat not have. She is apparently a skilled pickpocket. In The Fiery Menace Pat picks Monk's pocket to get his key to the 86th floor headquarters (apparently her own having been taken away from her). In The Time Terror when Doc locks Pat in the library, she simply picks the lock to get out. In the course of her adventures with Doc and the Fabulous Five, Pat had ample opportunity to use a variety of weapons and even gadgets. Even so, her favourite weapon was still her single action revolver. She was wearing it when she first appeared in Brand of the Werewolf and is still using it towards the end of the run of Doc Savage. The powerful revolver is quite apparently a Colt Single Action Army, better known as the Colt Peacemaker, although it has had some modifications over the years. In fact, it had apparently been modified between Brand of the Werewolf and Fear Cay. In Fear Cay it has neither a sight nor a trigger, but a fanning spur has been welded to its hammer. In The Annihilist it is mentioned that Doc had designed mercy bullets (the non-lethal anaesthetic bullets used in all of Doc's guns) for the handgun, although one would think even a mercy bullet from the powerful .45 would still kill its intended victim! In The Terror in the Navy, when Pat points the weapon at some of the villains, it is mentioned that its barrel is so big that any of them could easily stick their little finger down it. The gun figures prominently in the novel Violent Night. There it is said to weigh more than four pounds and has a large ivory grip. It is also said to have been made before Jesse James's days, although this is simply not possible. Colt introduced the single action revolver in 1873. Not counting his activities during the War Between States, Jesse James was active as early as 1867. Of course, this is discounting the possibility that Doc's skill in designing firearms runs in the family and Pat's grandfather or great grandfather invented the single action revolver before Colt Manufacturing Company did. While Pat favours her trusty six shooter, she does use other weapons as well. In The Annihilist she carries one of Doc's supermachine pistols in her purse, while in Spook Hole she threatens the villains Braske and Ropes with one. Pat also uses her cousin's gadgets on occasion. Along with the supermachine gun, in The Annihilist it is mentioned that Pat also has a tear gas gun disguised as a fountain pen in her purse. In Death in Silver it is revealed that the mouthpiece on Pat's phone is so equipped as to spray tear gas when she activates it. In Murder Mirage, while posing as Lady Sathyra Fotheran, Pat is equipped with a chemical mixture in one of the heels of her shoes that, when rubbed against something, will explode with a blinding flash of light. Unfortunately, Pat does not have time to remove her shoes before she is kidnapped, and must rub her shoes together to activate the chemical. While the resulting noise and flash of light cause the driver of the car she in which she is being held to wreck, allowing Pat to get away, it also makes it so Pat can hardly walk for a time. Regardless of Pat's experience in Murder Mirage, she still enjoys using gadgets. In fact, it is revealed in I Died Yesterday that she has a small museum of Doc's various gadgets, obtained with the help of Monk. She even has a room next to her office filled with them. In the course of I Died Yesterday, which could practically be considered Pat's only solo adventure (although she is assisted by Monk), she used everything from the glass balls filled with anesthetic gas to smoke bombs. Like Doc, Pat had her fair share of vehicles. In The Fiery Menace it is mentioned that she owns a dark coupe named Clarence, two cars called Tarzan and Adolph Hitler, and a truck called Churchill. As revealed in Poison Island, she also owns her own three masted schooner named Patricia. It with this schooner that Patricia Savage is going to deliver Doc's gold from Hidalgo to New York City. To own a schooner, it can be assumed that Pat Savage is fairly wealthy. Indeed, by her third adventure, Death in Silver, she has used the money from her father's estate to set up her own, high priced boutique on Park Avenue in New York called the Park Avenue Beautician. The Park Avenue Beautician is very sumptuous establishment, complete with uniformed doormen. Its waiting room is furnished in chromium, enamel, and expensive rugs. Her staff is made up of some of the most beautiful women in New York City. The Park Avenue Beautician even has its own gymnasium. Patricia's clients belong to New York's high society, many of who undergo the Special Egyptian Clay Pack Facial, which Pat herself developed. By the time of The Yellow Cloud Pat has changed the name of her beauty salon to Patricia Incorporated. And, if anything else, it is even more sumptuous. She has even employed a plastic surgeon, Florenso, whose office is on the seventh floor. Of course, for his office to be on the seventh floor, the boutique must occupy at least seven floors--pretty impressive even for a high priced establishment. Beyond running her boutique and getting involved in Doc's adventures, Pat has had one other job over the years. In Violent Night Pat had been working as a war correspondent in London, but lost her credentials when she blew up because she would not be permitted to go to the front. Pat's final appearance in Doc Savage would be in its January 1948 issue, in the novel I Died Yesterday. One of the novels which Lester Dent wrote in first person, this one is narrated by Pat herself. It can quite aptly be considered Pat's only solo adventure in the pulps. It is Pat who first becomes involved in the case and Doc is off stage for much of the adventure, leaving the majority of the action to her and Monk. Interestingly enough, while the appearance of gadgets had diminished since World War II, in I Died Yesterday they appear very frequently, Pat utilizing them at every turn. 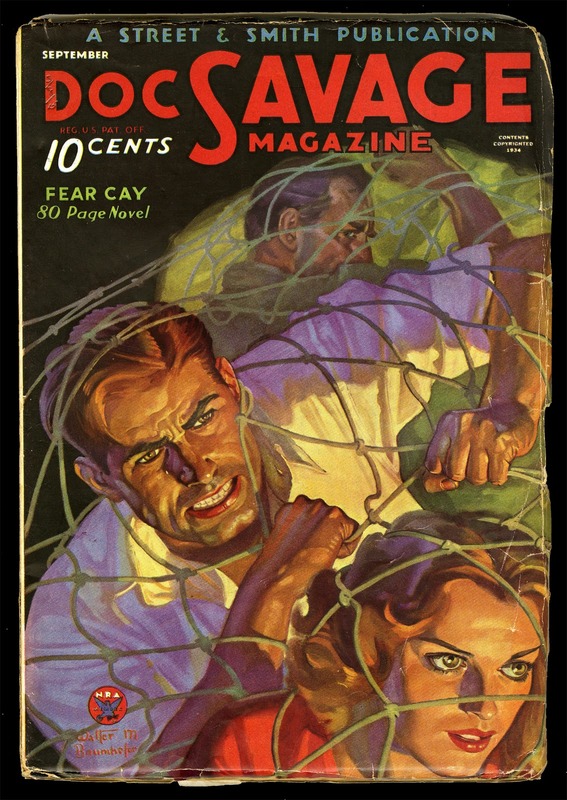 Of course, the demise of the Doc Savage's pulp magazine did not mean that Pat would disappear as well. She would appear in Marvel Comics' adaptations of Death in Silver (Marvel Comics' Doc Savage no. 3, February 1973) and Brand of the Werewolf (Marvel Comics' Doc Savage no. 7, October 1973 and Marvel Comics' Doc Savage no. 8. November 1973). She would also appear in Millennium Comics' original mini-seires The Monarch of Armageddon (November 1991 to May 1992). Millenium would even publish a one shot Pat Savage comic book (October 1992) in which Pat crosses paths with the Mob. Today it is quite probably that Patricia "Pat" Savage is the most famous woman to emerge from the heroic pulps. And there can be little doubt of the reasons why. She was in many ways the perfect, female counterpart to her cousin. Pat was spectacularly beautiful, yet very much her own woman. She could fight as well as any man, deadly with her six shooter and skilled in boxing, fencing, and jujitsu. She could fly a plane, pick locks, pick pockets, speak Mayan and German (although she was not very good at the latter), knew Morse code, and was a very convincing actress. She also had an undying love of adventure, which she shared with her cousin (even if Doc would never admit it). Over the course of her adventures Pat emerges as a fully realised character, perhaps more fully realised than any female character from the pulps save Nita Van Sloan from The Spider. This could very well be the reason she still has more than her fair share of fans to this day.